Four small covered dishes of almonds, pumpkin seeds, chocolate chips, slices of lime and three different types of salt were set up beside the tequila. “Awaken your taste buds by enjoying several dried pumpkin seeds with chili powder,” the card began. Then it instructed us to sip the tequila and savor its flavor. “Rather than gulp shots all at once, drink it slowly, using only the tip of your tongue initially,” it cautioned. “Then let it cover your entire tongue and run smoothly down your throat.” My husband enjoyed the first taste, but I needed more convincing. When it comes to iconic beverages, the U.S. is known throughout the world for its Coca-Cola and France for its Champagne. Similarly, tequila, a distilled spirit that is generally 70 to 80 proof, is considered to be Mexico’s national drink. And Mexico is the only country that makes authentic tequila. In Los Cabos, at the tip of Baja California, tequila is imbibed in various ways: slugged down by party revelers and tourists at late-night bars in downtown Cabo San Lucas; sipped and savored, much like fine wine, in more upscale establishments; and ubiquitously used as a base in popular mixed drinks, such as margaritas or tequila sunrises, and in cooking. Thus, it is common to find tequila masters, who are trained and certified to promote tequila, working beside sommeliers at hotels, bars and restaurants. In the 1500s, Spanish conquistadors arrived and began distilling the fermented drink into its present form. According to Mexican law, the drink can be called “tequila” only if it is grown in the state of Jalisco (near Guadalajara), in areas of the surrounding states of Guanajuato, Michoacan, Nayarit or in the state of Tamaulipas. The hours before sunset Tuesday and Friday evenings at Las Ventanas are designated tequila time. At 5 p.m. on both days, tequila master Epifanio Alvarez offers lessons and a tasting for guests at the tropical-looking, open-air palapa bar (whose roof is made of palm leaves). “We have the responsibility as ambassadors of Mexican traditions to introduce our guests to one of the most representative cultural icons, the 100 percent blue agave tequilas,” said Las Ventanas executive chef Fabrice Guisset. After signing up for the course, we found ourselves sitting at a colorful, beautifully set table engaged in lively conversation with three other couples, who became our fast friends. Epifanio is a warm and engaging ambassador. 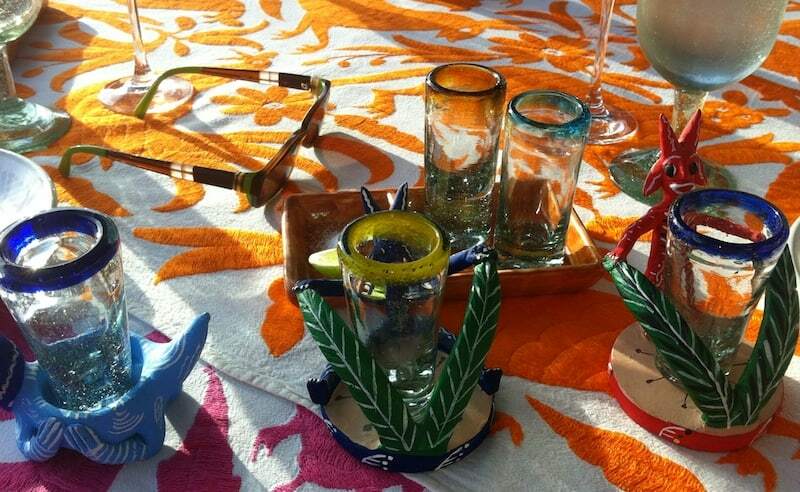 Each place setting included a set of handblown shot glasses (called caballitos, or little horses) and two glasses of sangrita, one red and one green. This sweet and spicy juice-based drink often is used as a chaser for tequila. Much as in a wine tasting, we sampled four different types of tequila as we chatted about our favorites. They included blanco, which is bottled right after distillation and is probably the purest and sweetest form; reposado, which literally means “rested” because it remains in wood barrels or tanks for two to 11 months and tastes more earthy; amber-colored anejo, which is aged for at least a year and generally has a smooth taste; and extra anejo, which is aged more than five years and is the most costly of tequilas. Between sips, we munched on homemade taco chips and ceviche. We learned that tequila comes in every price range when we ogled a bottle of black Clase Azul that our teacher brought out from the bar. And just so you know where the high end sits, he told us the bottle was more than $2,000, or about $378 a shot (which I assume is sipped). Epifanio reminded us that when it comes to drinking tequila, it’s important to determine whether the bottle reads “100 percent de agave” or “tequila mixto” (mixed), which has to have at least 51 percent agave. He explained the rich history of tequila, recounting that the Jose Cuervo family has used the same recipe since 1795. At the end of the course, each student was given a personalized diploma as a “tequila aficionado.” Yes, I’m a bit more knowledgeable about tequila now, though I’m still not enthusiastic about drinking it straight up. I do, however, appreciate the relaxed Mexican style of sitting outdoors, sipping a drink, nibbling food and chatting with friends while watching another magnificent sunset. Palates differ, of course. Before my husband left the airport at Los Cabos, he snagged a bottle of tequila (anejo) to take home, and he hopes to return to Las Ventanas for a refresher course or advanced studies. Check with each of the properties regarding times and prices for tastings. I never realized there was so much to tequila! Sounds like a fun time (even if you don’t like drinking it straight up). Irene, very nice piece on tequila. The only one I’ve found that I can actually sip is Patron. I’ll try some chocolate chips, though—sounds like the way to go. What was so special about the $2000 bottle of tequila? This post reminded me of trying different types of Calvados (apple brandy) in Normandy. Yes Alexandra. Fine tequila is often sipped like fine brandy. I would imagine its price is similarly determined by factors like the quality of the tequila, the amount of production available for consumption, etc. Now this is something I think I could not do without getting drunk, but it sounds fun. I can’t do tequila and never really thought there was an art to tequila tastings. Thanks for this post. I probably would not be good at tequila tasting. I’d have one sip and fall over into a deep nap. I can do about one small glass of wine and that’s it! What fun that you were given directions on how to taste tequila.